Tim Pike (1 Nov 2014 & 2 Aug 2015) & Philippe Serra (3 Aug 2016). Many thanks to Tim Pike who as well as the images was able to provide much of the information on which the following is based. In about 2010, a temporary marking in the form of a pipe sculpture designed to represent the intersection of the Greenwich Meridian with the 45th parallel was set up around 150 m to the south east on land owned by a friend of Stanghellini (see next mark north). 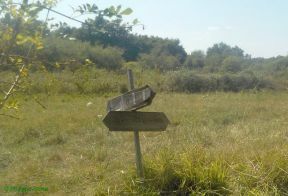 On discovering the original intention to mark the actual intersection, Pike and his friends, who were visiting the site of the intersection on a rainy day at the start of November 2014, took it upon themselves to erect a home-made sign at the spot, with the expectation that it would quickly disappear. The 2014 image has some images (extracted from a video) showing the sign being erected. Since its erection, the stuck on labels have been replaced at least twice, each time with ones carrying a different form of words. Images on the degree confluence website (link below) suggest that a temporary mark was also in existence in 2004.